The Bosch line of cordless tools uses the industry's most advanced Lithium-ion technology for greater battery life and more run time, all in a lighter package. The lightweight design of the PS130 12V Max hammer drill/driver is ideal for easy handling in overhead operations and tight spaces and lets users tackle professional jobs with ease. 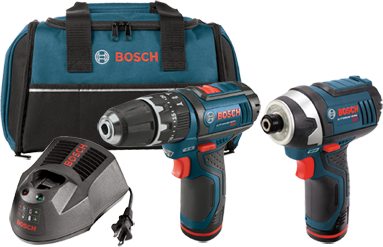 The Bosch PS41 12V Max impact driver offers the precision of variable speed, a light body and a short head length.